Berkeley College has been recognized as a Top Veteran-Friendly School by U.S. Veterans Magazine. The honor is part of the magazine’s annual “Best of the Best” evaluation of more than 350 American employers, initiatives, government agencies and educational institutions dedicated to providing opportunities to veterans, transitioning service members, disabled veterans, spouses and veteran business owners. Berkeley College was among three educational institutions located in New Jersey, and among 18 in New York, to receive the recognition. “We are honored to receive this recognition from U.S. Veterans Magazine and continue to be committed to veterans and military students,” said Richard E. Robitaille, EdD, Berkeley College Assistant Vice President, Office of Military and Veterans Affairs. The results from the evaluation will be published in the summer issue of U.S Veterans Magazine and available on newsstands mid-August. Click here to review the entire list of companies and institution being recognized. Earlier this year, Berkeley College was designated as a Top 10 Military Spouse Friendly School in the nation by Victory Media, originator of the family of Military Friendly® resources for veterans and their families. The designation came shortly after Berkeley College earned a 2017 Military Friendly® Award and was ranked a Top 10 Nontraditional School for outstanding commitment to, and programs for, veterans and their families. 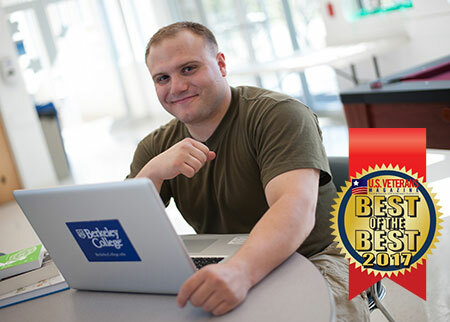 Berkeley College has also been recently named to the Military Times “Best for Vets: Colleges 2017” list for the fourth time, as well as ranked among the Best Online Bachelor’s Programs for Veterans by U.S. News & World Report for the fourth consecutive year, placing at No. 65. The Berkeley College Veterans and Gold Star Reflections projects will be on display at the Association of the U.S. Army in Arlington, VA, through June 2017. Berkeley College student-veterans, family members, faculty-veterans and military families in the community posed for these Reflections projects – personal portraits that capture the emotional issues that stay with veterans. Click here to learn more about the exhibit at the Association of the U.S. Army. The Berkeley College Office of Military and Veterans Affairs provides support to its student-veterans through six on-site veterans resource centers (VRCs) in New Jersey and New York, as well as through an Online VRC. At the VRCs, military students can meet with staff, network with their peers, and learn about Veterans Administration benefits. Berkeley College participates in the Yellow Ribbon Program under the G.I. Bill and collaborates on national ventures with the National Guard, the Army and the Air Force, the GoArmyEd distance learning program, and the Navy College Program Distance Learning Partnership. Click here to learn more about the Berkeley College Office of Military and Veterans Affairs.